Every day now seems to bring a little more of the same thing – confirmation that we are all sitting on a bus with a "no deal" destination board. The latest comes via an intervention from Angela Merkel at a conference in Frankfurt where she was speaking to German finance chiefs. What she had to say was not exactly earth-shattering, but it was clear enough: "We don't want the discussions to break down", she said, adding, "We will use all our force and creativity to make sure a deal happens". Then, in what some might think is a statement of the bleedin' obvious, she declared: "We don't want these negotiations to collapse. But we also can't fully rule that out because we still have no result". Like so many things, though, the words take on their significance from their context and timing – and from who says them. A German chancellor tends to be a good start, but the timing is the thing – it's exquisite. Merkel is said to have generally played a backseat role in the talks, preferring to intervene only at crunch points at European Council meetings. And here we are at another crunch point and, just as the temperature is rising, she is stepping in not with a prediction but with a warning. That, at least, is the way I see this. Angela Merkel is sending Mrs May a message, telling her that she needs to up her game. Barnier has already made it clear that the Chequers plan is "dead in the water" and now it comes from the topmost level. May is on notice that she needs to come up with something better. The trouble is, as we all know, the cupboard is bare. But that is the least of Mrs May's problems. From all accounts, she seems actually to believe her own propaganda, with Downing Street telling us: "Nobody else in British politics has a detailed plan for our future relationship that delivers on the instruction of the British people and is negotiable with the EU". The real issue, therefore, is a pervading sense of self-delusion, made worse by the prime minister having told her cabinet colleagues that her plan had received a "warm and positive" response from EU capitals during what is being described as a summer-long diplomatic offensive. And now, it seems, Mrs May is pinning her hopes on the informal European Council in Salzburg later this month where, we are told, the EU27 are planning a "carrot and stick" approach to Brexit, offering Theresa May warm words on her plan, which she can take to the Conservative Conference in the hope that it will calm the fevered breasts of the faithful. Yet nothing of this is real. The basics haven't changed. The talks are still at an impasse, the Irish border is still the sticking point and there is nothing on offer which will get close to solving Mrs May's domestic political problems. On this front, she seems to be getting little practical help, even from her Brexit Secretary Dominic Raab. He has been talking to the House of Commons, making nonsensical statements about the effects of Brexit on the car industry being a "negotiating ruse" deployed by M. Barnier. Those concerned about potential damage should be, he says, "showing a bit of mettle". As for the European Council at Salzburg, all the indications are that Mrs May will get a polite hearing and then the heads of states of governments will get down to the business that they came for – and that isn't Brexit. Whatever she gets to take home will be just fluff, a small gesture of solidarity to help out a fellow politician in need, and possibly to help keep Mrs May in Downing Street. Despite this, the myth still prevails within the heart of the UK government that we can somehow finesse a deal with the Member States, to which effect Mrs May is said to be planning to increase her direct lobbying of European leaders, in the hope that they will take over the deal, cutting Michel Barnier out of the loop. The line being taken by Mrs May's official spokesman is that: "The negotiations are taking place with the Commission; we have always respected that fact. But equally this is a decision that at the end of the process will be taken at a political level by the European Council, so you can obviously expect a continued and strong engagement with fellow European countries". Yesterday, however, I was writing about the importance of the Article 218 procedure which governs negotiations between the EU and third countries. That same Article is also brought in by Article 50 to set the parameters for the UK's exit negotiations, defining the procedures that must be followed. Whatever the delusions that may be harboured in Downing Street in general and Mrs May in particular, therefore, there is simply no legal mechanism by which Member States can take a lead role in the negotiations. The EU is committed under treaty law to following Barnier's lead. Only when he presents them with an outline withdrawal agreement and his recommendations can the Member States act, and then only through the European Council. What Mrs Mays advisors also seem to be forgetting is that any deal must be approved by the European Parliament (pictured). The indications here are that the vote cannot be taken for granted and will be no walkover. Any hint of a back-room stitch-up between the Member States – even if it was possible – would get short shrift in an EP keen to assert its own authority. Nevertheless, the prospect of dealing directly with the Member States has been a theme on offer right from the start, indicating yet again the fundamental failure of the British establishment to understand the nature of the European Union and how it works. Imbued with the myth that Germany (with or without France) runs the EU, there is a comprehensive inability to get to grips with the fact that the very constitution of the EU is such as to prevent dominance by a small number of big states. This is what QMV is all about and even France and Germany acting together can be over-ruled by the other states. 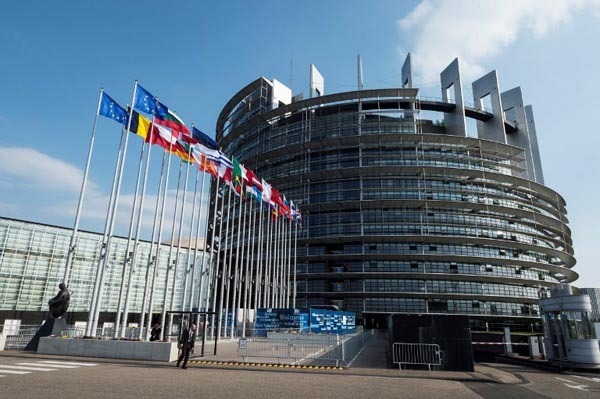 Then, as an independent institution, the European Parliament has been growing in authority and stature and would not shrink from confronting the European Council, if it suited the members, many of whom will take political direction from their domestic parties, outside the remit of their own governments. But if institutional dynamics are not understood, neither is there the ability to understand the general constraints under which the EU is acting. This came over clearly with Raab's intervention. Where Barnier is simply stating the inevitable – and entirely impersonal – consequences of applying EU laws to trade with third countries, the Brexit Secretary sees it as an attempt to put pressure on the UK delegation. This brings us back to Merkel's intervention and, if there is a deeper agenda at play here, it is the growing realisation amongst the "colleagues" that they are dealing with a dysfunctional negotiating partner which is incapable of responding rationally in the Brussels talks. It has taken the various EU actors some time to realise just how inept our own government is but, with that realisation, we have Mrs Merkel also admitting that a collapse of the talks is on the cards. I don't think this has ever been acknowledged at such a high level. This appears to be matched by active measures being taken by the German government to prepare for a "no deal" exit, including hiring more customs officials to deal with the additional border checks that will be required. It comes to something, however, that even the regional newspaper, Stuttgarter Zeitung is writing that "time is running out", but also citing Barnier's comment that: "We do not need more time. What we need are political decisions". That sentence may well come back to haunt us should the UK ever look for a time extension under Article 50. As the delusions in the UK camp multiply, the EU may take the view that there is no point in prolonging the agony, and cut its losses.